Superbly located in the popular seaside resort area of Glenelg, this beautifully appointed, spacious, fully self-contained, recently modernised interior apartment offers a range of features to delight the most discerning traveller. Enjoy the sea-breeze while relaxing in the private front-courtyard, perfectly located opposite Colley Reserve and Glenelg Beach. Experience the luxury of taking advantage of the spectacular park views whilst either preparing meals in the kitchen or dining at the table or lounging in a comfortable chair. 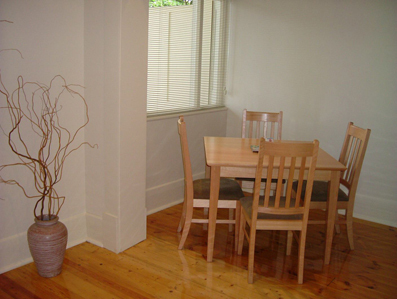 This ground floor apartment provides two bedrooms, a lounge and dining area, fully equipped kitchen, bathroom with shower over a small one metre square bath tub and laundry facilities. 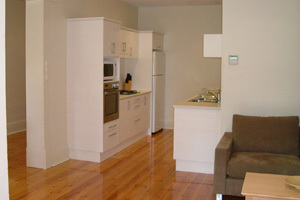 Parkview Apartment is walking distance to Glenelg Beach, the famous cosmopolitan Jetty Road 7-day shopping precinct, cafes and restaurants, Holdfast Shores Marina, the Beachouse fun park, galleries, antique stores, local library, play-ground, the Stamford Grand Hotel, and trams which run between Glenelg & the city of Adelaide. A perfect place for a romantic getaway, family or business holiday. Master bedroom with queen size bed that overlooks the rear courtyard. Second bedroom with double size bed. Rates are based upon: length of stay, season, apartment size, location and facilities, number of persons, number of apartments booked and servicing requirements. Regarding check in, could you please phone Anita's mobile: 0411 102 773 30 minutes prior to check in.